FRANK DIMON/Sun-Gazette Correspondent Muncy’s Ty Nixon tries to spin behind Newport’s Mason Huggins during the PIAA Class AA Team Championships at the Giant Center in Hershey on Friday. HERSHEY — Ty Nixon walked off the mat a little taller Friday afternoon. For one of the first times this season, the Muncy freshman was full of confidence and he carried himself that way. 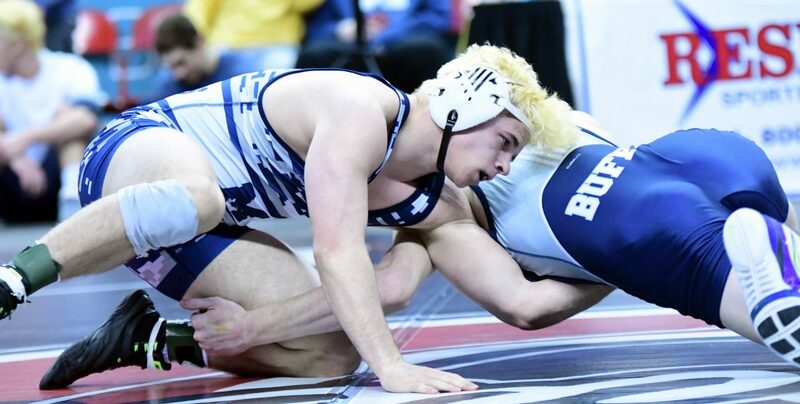 Wrestling up a weight class in both of his bouts at the PIAA Team Wrestling Championships, fans got a glimpse at what made him such a highly-touted newcomer in District 4 at the start of the season. 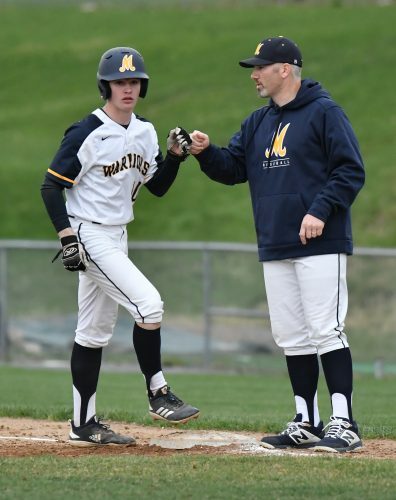 Nixon scored a pair of wins for Muncy yesterday as the Indians went 1-1 and were eliminated from the Class AA field at the state team tournament. It’s the kind of moment he’s been waiting for to help take him over the hump of what has been an inconsistent first season. The former PJW state champion didn’t have any choice but to let the fur fly, especially in the Indians’ final dual against Brookville. He could see the score as he took his spot in the center of the mat. 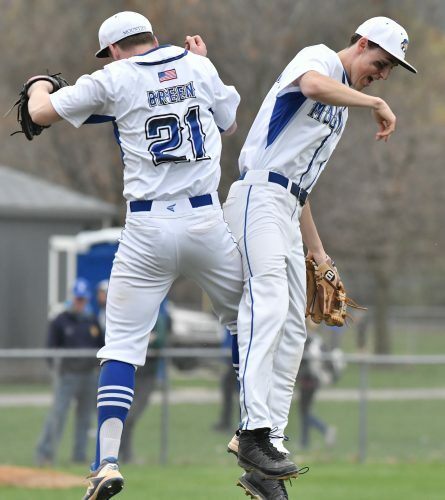 Muncy trailed the District 9 champions 21-18 with only four bouts to go and he knew his 170-pound bout with the Raiders’ state-ranked Elliot Park was going to be pivotal in deciding the dual. So he threw everything he had at the sophomore. He didn’t overthink his way through the bout. He, instead, let his abilities take over and it was a breathtaking performance. Nixon recorded three takedowns in a 9-4 victory. It tied the dual and gave the Indians every opportunity it needed to try and win the dual. Nixon, the younger brother of former Muncy two-time state placewinner Dakota Nixon, entered the day with a 21-12 record. That record was emblematic of how much of a rollercoaster his season has been. He’s struggled at times to find his footing and to be able to pull the trigger on the lightning-quick offense which has made him such a highly-touted prospect coming into the season. But if his performance Friday as he scored 14 points in two bouts against quality competition is any indication of where he is come the start of the individual postseason next week, it’ll be quite the few weeks. Against 20th-ranked Park, Nixon never hesitated. He felt out Park through the 1-minute first period, and after Park escaped quickly to start the second, Nixon went to work. He hit a blast double for his first takedown. He added another less than a minute later. And leading 5-3 in the third period, he ran through Park for a four-point move which all but put the bout away.